Once again, the US has pulled out of UNESCO, ending a saga that began with the removal of 22% of UNESCO’s funding in 2011. The divorce started when the agency accepted the Palestinian territories as an independent member state, triggering a US law which prevented it from funding any organizations that recognized Palestine as a country. This financial blow threatened to paralyze the agency’s operations, however six years have passed by and UNESCO has managed to adapt to the circumstances. It is important to note that in spite of the symbolic gesture of pulling out, UNESCO is not one of the crucial agencies in the world of multilateral organizations. For that reason, the role of fostering dialogue and cooperation by these institutions across the globe is hardly threatened. Additionally, despite the conservative cheer and the pro-Israel political bonus for Trump, pulling out of UNESCO has no tangible repercussion in the US’s support of multilateral organizations. At most, it portrays an ideological school of thought that has had more bark than bite in the current administration. The fact that the United States is the biggest funding partner of the UN, the World Bank, the International Monetary Fund and many others, demonstrates the importance of multilateral organizations as a foreign policy tool of the US. These organizations help shape the rules and regulations of the international arena. Having a say in these processes constitutes an important tool in the objective of projecting power internationally. Moreover, these organizations foster cooperation and communal action, especially when tackling cross border challenges such as climate change or terrorism. Pulling out of UNESCO was but a small gesture that was gestated in the Obama administration and which constituted a small win for Trump’s political base. It’s effect in multilateral organizations will be negligible. In the short run, multilateral organizations like UNESCO will lose credibility and legitimacy over major players choosing to leave. In a world where globalization and multilateralism are currently out of vogue for developed states, organizations like the UN, the EU, and NATO will struggle to carry out their objectives effectively and in concert as contributors either leave or seriously reduce resources and support. This will only be temporary. The beauty of democratic nations like Israel and the United States is that a changing of the guard is mandatory. Once the Trump administration and the Netanyahu government are voted out, reach their term limits, or otherwise leave office; it is very likely that Trump and Netanyahu – considered hardliners in their respective national politics – will be replaced by more moderate policymakers. These successors will hopefully realize the need to rejoin those neglected multilateral institutions for the potential to increase international political power and legitimacy, if not for the need to build an international community. In fact, the “vacations of nations” are quite common within these institutions. The US, for example, had left the UN Human Rights Council under the Bush administration only to return under the Obama administration. Canada itself withdrew from the UN Convention to Combat Desertification during the Harper government’s rule, returning shortly thereafter under the new Trudeau government. Multilateral organizations, if they remain influential and fundamental to global affairs, will survive in the long run. The Ricardian theory of comparative advantage comes to mind as the appeal of social, political, economic, or military benefits to member countries is just too great to pass up when compared to the alternative of isolationism. UNESCO has suffered a tough blow, but it will endure, and it will become strong once more. The US and Israel’s departure from UNESCO in itself is not that surprising. The timing of the withdrawal, however, is. UNESCO has a long history of anti-Israel resolutions, which attempt to minimize the Jewish connection to Israel, effectively politicizing the organization. The US stopped funding the organization in 2011, due to a US policy of not funding UN bodies which admit Palestine as a member. Furthermore, this is not the first time that the US has left the organization. The Reagan administration left the organization in 1984, citing a Soviet bias. The US announced its departure on the heels of an election, which nominated French national and former culture minister Audrey Azoulay as the new director of the organization. Azoulay is the first Jewish director of the UN body and has family in Israel. Furthermore, the day before the US announced it was leaving Israel had a victory at UNESCO when it was able to delay a pair of anti-Israel resolutions. It seems like an odd time for the US to leave, especially considering the recent developments just mentioned. Even more bizarre are the reports that the US did not consult Israel before its decision to leave the organization, effectively forcing Israel to leave as well. Strangely, both countries are departing UNESCO at, what could be, a turning point in its anti-Israel stance. In my opinion, this was a move by Trump to score political points with his base, which is deeply skeptical of multilateral organizations. It will also be welcomed by the Israeli right, which is also very anti-UN. Unfortunately now though, the perceived anti-Israel rhetoric at UNESCO will continue unchallenged. There has long been a debate within Israel over whether it is best to attempt to reform organizations with an anti-Israel bias from the within or to not participate in them at all. Just as it seemed they might be successful in changing UNESCO from within, they lost their seat at the table. I believe that Israel and the United States leaving UNESCO signifies an erosion of international cooperation. Surprisingly, UNESCO has been one of the rare institutions in which North Korea has actively participated. As Pyongyang was the capital of many Ancient Empires such as the Gojoseon (2333 BCE- 108BCE), Goguryeo (37BCE-668AD) and Goryeo (918-1392), it sits on top of some of the richest archaeological sites in all of East Asia. Unsurprisingly, North Korea has used the artifacts and ecofacts found in Pyongyang’s archaeological sites to increase the legitimacy of the current regime. The typical images which depict Kim Ilsung and Kim Jongil as the direct descendants, and only representatives of Dangun, the founder of Gojoseon, are examples of the politicization of these artifacts. Thus, after North Korea was accepted as the 153rd member state of UNESCO, in 1998, historians of the regime registered the remains of Gojoseon, Goguryeo and Goryeo to become world heritage sites. Finally, in 2003, the regime sent an application titled ‘A Collection of Goguryeo Tombs’ to be reviewed by UNESCO. This application received much attention, not only because it was from North Korea, but also because Goguryeo had held territories in China and Russia as well as Korea. When the registered tombs were approved as world heritage sites, delegates from China expressed concerns, as the application stated that Goguryeo was a predecessor kingdom to present-day North Korea. China of course wanted to block the tombs from being registered. With this Chinese intervention, the North Korean delegates shifted their efforts from historically researching Goguryeo to convincing the delegates from other countries, including those representing the United States, not to support China. The North Korean representatives argued that their application still has historical and scientific merit despite the claims from the Chinese delegates. 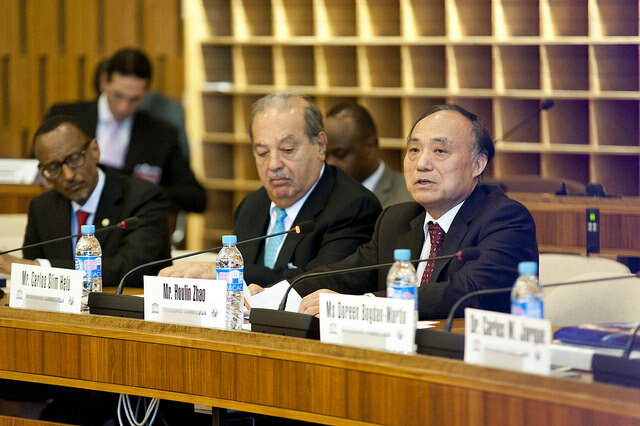 Therefore, I believe that Israel and the United States leaving UNESCO signifies a definite erosion of international cooperation, because UNESCO is one of the few organizations through which the North Korean regime has consistently invested efforts to work together with the international community through peaceful means. One may even argue that UNESCO was one of the few channels where North Korean and American ambassadors could divert away from their usual hostile exchanges and converse in a productive manner. Multilateralism has been a major pillar of public diplomacy since after the Second World War. Although the United States pulling out of the United Nations Educational, Scientific, and Cultural Organization (UNESCO) has caused a conundrum in the international community, people should remember that this is not the first time this has occurred. In December 1983, the United States announced their intention to leave UNESCO by the end of 1984. The reasons for this departure were mismanagement of funds and politicization of issues. Soon after, a founding member of the organization, the United Kingdom, followed suit and announced their departure by 1985. Though both the U.S. and the U.K. are currently a part of UNESCO (the U.S. withdrawal is set for December 31st, 2018), the points they raised in the 1980s still hold true. Multilateralism is beneficial in an increasingly globalized world – in theory. It makes sense to create global platforms and try to get along with each other. But it is easier said than done, and we are all privy to the bureaucracy in such organizations. With people having access to information more than ever before, and with travel being much easier than it was before, the world has changed considerably. Maybe it is time for multilateral organizations to change too. The U.S. and Israel leaving UNESCO gives us an opportunity to re-evaluate the methods by which multilateral organizations are managed. I do not believe that this was their goal. Trump seems more interested in causing uproar than actually fixing the system. But I think this is a good opportunity to look at how these organizations must evolve to accommodate emerging economies, non-state actors, as well as the vast effects of social media and quick-information uptake. Though it seems unachievable, multilateral organizations were conceptualized to promote peaceful dialogue and international cooperation, and although there are many inspirational documents and communiqués that come from these organizations, they seem to do actual work reflexively rather than pre-emptively. If the future of multilateralism is in question, I believe this is a good thing. We absolutely should be debating the efficiency of such organizations, and holding them to higher accountability. Photo: Meeting at UNESCO Headquarters in 2015. By ITU Pictures. Licenced under CC BY 2.0.